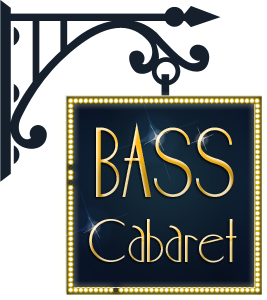 Bass Cabaret: Bonnie & Clyde ft. ANTISERUM + Irie Cartel + Burlesque took place on Sat. February 16, 2013 and boy was it the bee’s knees! Crowds showed up in 20’s and 30’s prohibition era costumes, sideshow, circus, bohemian, and Burner-inspired couture. I have to say this is one of the sexiest crowds I have ever seen and the costume contest would have been hard for me to judge, so I’m glad it wasn’t my decision! Left: Guests Michael Edmondson and Jeanna DeVille. Far right: Fou Fou Ha clowns with their renegade entry. As measured by audience applause, Jeanna (with the black parasol) and Michael (in the white button down) were the crowd’s favorite Bonnie & Clyde couple and took home the title of best-dressed Bonnie & Clyde couple, as well as complimentary tickets to the next show. All of the couples looked fabulous and we thank them for their participation. We also had a surprise visit from San Francisco’s Fou Fou Ha, who you can see on the stage causing a ruckus. The energy they brought, along with many other performers from the bay area performing arts community contributed very much to the awesome vibes of the night. Imagine a world where clowns wear colorful fishnets, tutus and lace-up boots. Glowing hoops circle the hands and waists of beautiful dancers wearing intricately beaded bodices and flowing skirts—some just sporting a modest pair of pasties. There is fog everywhere and it’s lit up like the aurora borealis. Melodic sounds and heavy basslines pleasantly flood the room while the crowd ebbs and flows with every wave. 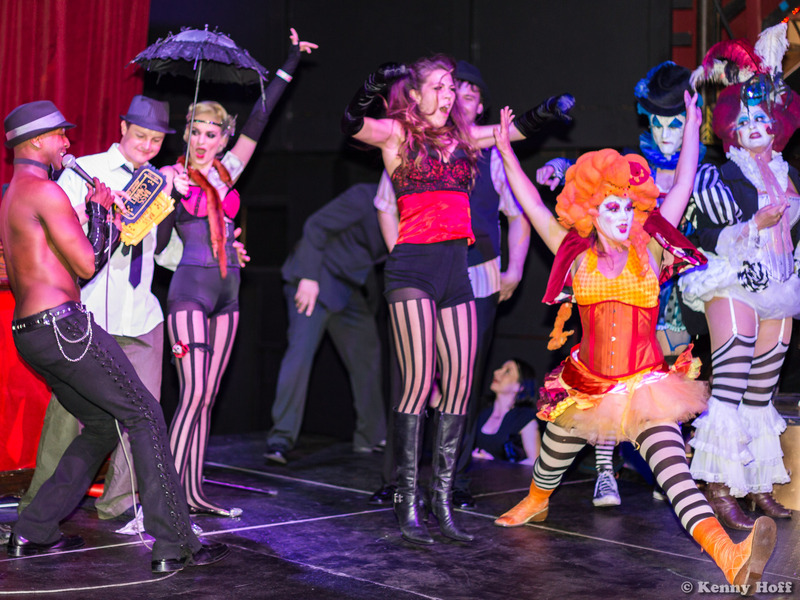 This world is not a fantasy — it was a reality at last weekend’s Bass Cabaret. There were costumes, dancing, awe-inspiring acts and a seductive burlesque show set to the sounds of San Francisco’s best electronic music producers and DJs. The crowd was feeling the Valentine’s Day love with our beautiful Bass Cabaret family at an awesome, one-of-a-kind new club in SOMA: Inner Mission. We can’t wait to return there for the next event. You may have heard of this venue which shares a space with artist collective, CellSpace. If you missed it, stop by Inner Mission at 2050 Bryant St, San Francisco, CA and check out their amazing craft cocktails. This venue has been transformed into an event space while still providing a home for many of the bay area’s top performers. Antiserum ( Smog/ Dub Police/ SF) is an electronic dance music producer from San Francisco, whose originating style of West Coast bass music emerged during the dawn of the Bay Area dubstep movement. Mr. Kitt ( Irie Cartel/Ritual Dubstep/ SF) has been rocking crowds for several years. Born into a British family from Gloucestershire, this first-generation American has been influenced by his British cousins and friends, who introduced him to early British Electro, 2-Step, Garage, Grime & Dubstep. Nebakaneza (Irie Cartel/Ritual Dubstep/ SF) is nuts! I think he is certifiably insane, but he seems to find his therapy by slamming Dubstep through the speakers. Johnny 5 (Irie Cartel/Ritual Dubstep/ Oakland) is an Oakland, CA resident by way of Chicago. He cut his teeth as an MC and hip-hop producer in both cities, sharing stages with the likes of independent legends Typical Cats as well as major acts including Raekwon and Devin the Dude. Erin Shredder is a professional circus artist who spends much of her time spinning on the aerial lyra, deftly manipulating any number of hula hoops (sometimes on fire), and lowering the jaws of the general populous. She is on a mission to enlighten and inspire by example. Strength, style, and the courage to shine combine to create her testament to the moment… don’t underestimate it’s potential. Anything is possible. TT is a professional performer, aerialist, aerial dance instructor and founder of The Gravity Arts, an aerial dance school in Santa Cruz, CA. She is a diverse performer whose training includes Alvin Ailey School of Dance in New York, Project Bandaloop, DeLeon Productions, UCSC dance department, Motion Pacific Dance Studio and Cabrillo College. Sasha Va Boom combines sultry modern music and dance with classic elements of burlesque, such as fan dances and the pure art of the tease. So get naughty and enjoy Sweet Sasha Va Boom shaking her tail feathers for you! Jodi Waseca is not your stereotypical bellydancer; she is a multifaceted and award-winning performance artist. Her stage presence alone brings you deep into her character and pulls at you to join her as she takes you on a wild ride. She may be seen shakin’ it with Beats Antique, Rose Harden, Ariellah and Deshret Dance Company, and Joweh R.A.W..
Suzil Von Schtupt’s burlesque routines are pumped with as much variety, comedy, and style as possible. She has graced many stages throughout the bay area including the Exit Theater, El Rio, the Uptown, Viracocha and many others. Alexa Von Kickinface: “the babe who keeps her big brain in her bra,” is a rising star in the Bay Area burlesque scene. Described as a cross between Marilyn Monroe and Pee Wee Herman, she dazzles audiences with signature numbers that not only titillate, but provoke giggles as well. Ms. Kittay is a newcomer to the Bay Area burlesque scene who oozes seduction with style and grace. Her sinfully slow strip will have you begging for more.